Students and prominent intellectuals have frequented the Academic Senate Yard ever since the University of Copenhagen was founded more than 525 years ago. 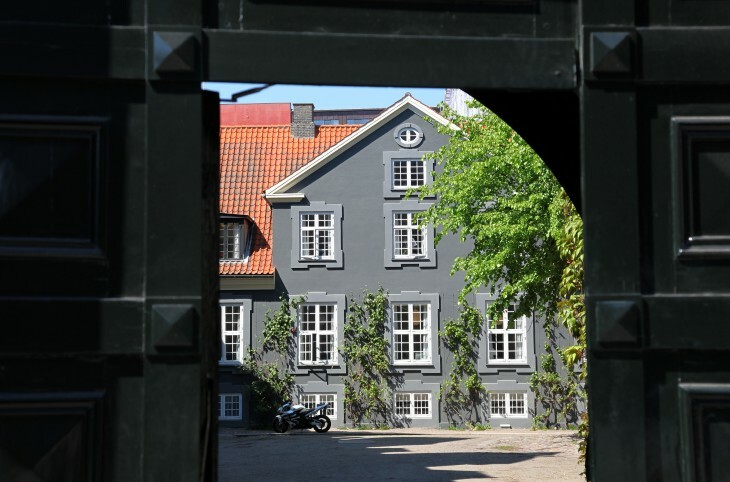 Enter the courtyard through the large, solid gateway facing Frue Plads, pass through the deep, arched port, and a small, cobbled square opens up before you. In the middle stands a tall lime tree surrounded by ‘Ove’s Bench’, named after former University Rector Ove Nathan. At the back of the University’s old main building, ivy covers the walls, turning a spectacular burgundy in autumn. Opposite the entrance is Copenhagen’s oldest secular building, the Academic Senate House (Konsistoriehuset), which dates from around 1420. This was originally the residence of the Catholic Bishop of Copenhagen, but following the Reformation, and for many years afterwards, it housed the supreme university body, the Academic Senate – members of which have included famous figures such as Ludvig Holberg, Adam Oehlenschläger, Ole Rømer and Niels Bohr. Peer through the pointed-arch cellar windows in the Academic Senate House, and you’ll catch sight of the medieval dungeon where rebellious students were incarcerated. Sit back on Ove’s Bench, enjoy the changing colours of the ivy leaves and feel the history. You may even find yourself in the company of one of the prominent intellectuals of our own day. Peace, quiet and a sense of history. The square is surrounded by a wealth of historical buildings: Kommunitetsbygningen (an old student residence), faces Nørregade and its oldest parts of which date from the 16th century. The Academic Senate House, which is Copenhagen’s oldest surviving house was built around 1520. The blue-black Professor Villa from 1732 is in a style called Citizen Baroque. The main building facing Frue Plads and the adjacent Ceremonial Hall dates from 1836. Frue Plads and the Church of Our Lady, the city’s cathedral, were designed by F.C. Hansen and built in 1826. There has been a church on this site since around 1200. The door into the yard is painted in a colour known as Copenhagen Green. The shade emerged in 1809 following the discovery of chrome yellow, which results in a deep green when mixed with the classic colour Parisian blue. It was originally called Amsterdam Green and was brought to Copenhagen by Dutch immigrants.